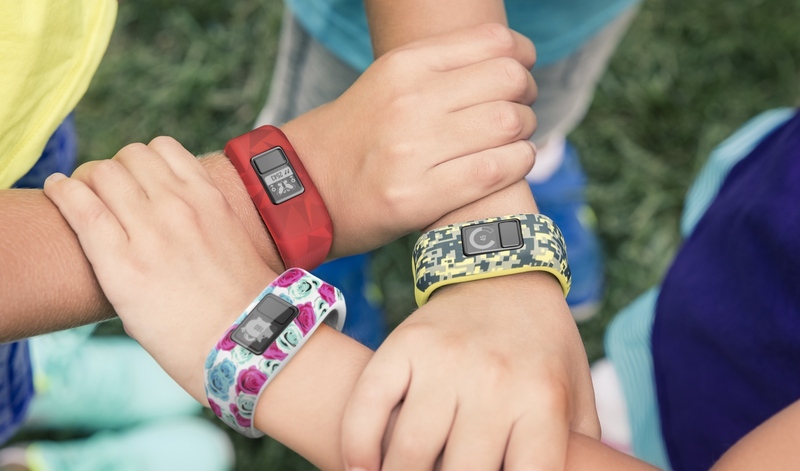 Will your kids go for the broken lava or digi camo band? Garmin is getting into the kids' wearables game with the Vivofit Jr, a $80 activity tracker that encourages kids to keep moving. Overall it's pretty nifty, based on Garmin's budget Vivofit tracker. The adorkably named Vivofit Jr aimed at four to nine year olds and comes in black, 'broken lava', 'digi camo', purple strike and flower pattern bands. It's 5 ATM water resistant so swim friendly and battery life is a year. The whole idea is to get kids moving for 60 minutes a day, what Garmin refers to as a 'daily play goal'. There's a companion app where parents can set challenges, assign tasks and rewards and get their children on 'mobile adventures' and 'adventure trails' where they can unlock fun facts. There's a Move bar, which we've seen on other Garmins, plus a task timer built into the watch face alongside the time and date. Parents get a summary of activity, sleep and goals and can manage multiple Jrs (children) from one account. The Vivofit Jr tracks steps, activity and sleep but there's no GPS for keeping an eye on your children's location as with slightly pricier options. We'll let you know more specs, details and availability when we have them.